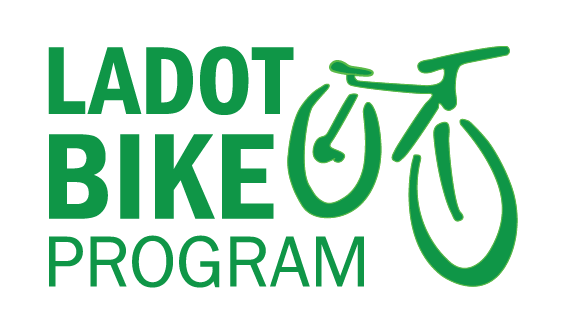 We’re always looking for ways to improve the LADOT Bike Blog to better help it fulfill it’s mission to give you, the reader, a closer look into the operations, motivations, rationale, and people of the LADOT Bike Program. 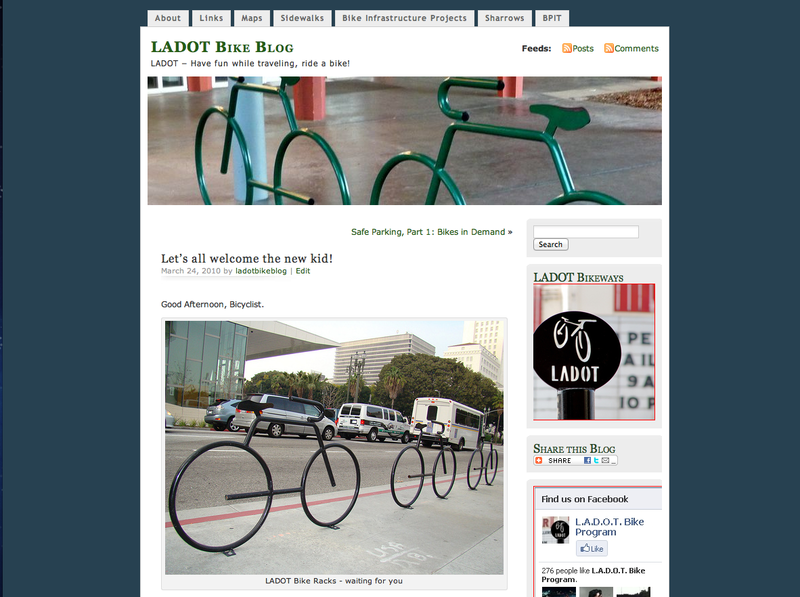 I’d like to introduce you to the new “Resources,” “BFS,” and “Parking” tabs along the top pane of the LADOT Bike Blog. Here’s a quick run through of what you can expect to find from each of the new tabs. The new “Resources” tab will now contain the formerly independent “Sidewalks,” “Links,” and “Maps” tabs. “Sidewalks” is still your one stop shop to find information on sidewalk riding in Los Angeles County. “Links” still displays links to important websites for the bicycling community including local transit agencies, city departments, bicycle co-ops, bicycle blogs, and various bicycle advocacy organizations. “Maps” contains various Google Maps and PDFs that display infrastructure projects, bike parking locations, and sidewalk riding information. Maps will also contain two new subtabs that will allow both individuals and bike shops to request L.A. City Bike Maps provided by the Department of Transportation. “Bike Projects” is the new name for the former “Bike Infrastructure Project” tab. This tab will now conveniently group together the tabs labeled “Bike Lane Projects,” “Bike Path Projects,” and the “Sharrows“. The “BFS” tab will be your ultimate resource for information on Bicycle Friendly Street’s within the City of Los Angeles. This tab contains a summary of what exactly a Bicycle Friendly Street is, as well as individual tabs for each BFS facility as they come online. The new “Parking” tab contains the Bike Parking Design Guidelines, LADOT Sidewalk Parking Program, Bike Corrals, and Survey Registration subtabs. Here, you will be able to find out what type of bike parking the City recommends, request new racks for businesses, view the City’s inventory of Bike Corral facilities, and register to participate in bike rack surveys. We hope these new tabs will be a valuable resource for everyone to enjoy. Be sure to leave a comment and tell us what you think about the changes, and feel free to suggest other tabs that you’d like to see. We close today with another quote from Christopher Kidd. It’s admittedly an ambitious vision. So take it easy dear readers. I am, after all, the new kid.